Alcohols « Global Market Insights, Inc. Driven by the escalating demand recorded on a global scale for cosmetics and perfumes, fragrance ingredients market is anticipated to make remarkable progress over 2018-2024. It is to be noted that one of the factors that has greatly influenced the direction of the modern fragrance industry is stringently meeting consumer demand which in turn has also extended its influence on the fragrance ingredients market. Formulators are apparently reinventing perfumes for personal products to create new scents that will attract and satisfy a much wider and diverse segment of consumers all over the globe. The fragrance industry encompasses key players across the skin care, makeup, hair care and bath products manufacturing sectors that set the shape, trend, concept and strategies for this business sphere, thereby influencing fragrance ingredients industry. 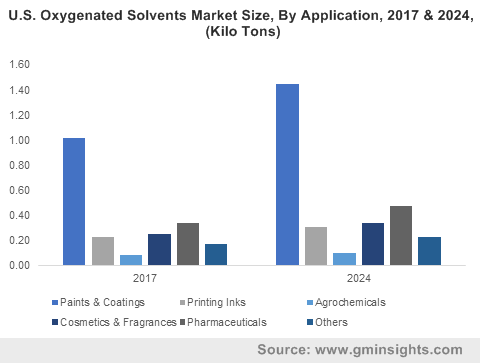 While fragrance ingredients are prominently used across a plethora of end-use sectors, such as soaps & detergents and toiletries, the beauty & personal care domain is likely to emerge as the principal growth avenue for the fragrance ingredients industry. As per Global Market Insights, Inc., fragrance ingredients market size is estimated to cross 1.5 million tons by volume by 2024. With increasing disposable incomes in the emerging economies as well as the recovering economies in the developed nations, a considerable boost in consumer spending on personal care products has been observed. New innovations are also on the radar, as besides women’s fragrances increasing demand for men’s toiletries and cosmetics in the last few years has acted as a catalyst for experimentation and expansion in the fragrance ingredients market, increasing sales stability. Considered a conventional element in the cosmetics industry, fragrances have thrived as an industry that has been largely driven by beauty trends and prevalent fashion. The use of perfumes which was once considered a non-essential luxury has come to be considered a must-have personal grooming product as competition in the fragrances industry has become steeper and perfumes have carved a place of their own in the personal care products segment. Though the use of perfumes has become common and an everyday affair, the fragrances ingredients industry has received a boost from use of the ingredients in mass produced products as well as in luxury products that bring special and personalized products to the market and still considered a luxury item meant for connoisseurs. Fragrance ingredients market size from fine fragrances & perfumes is thus set to grow at a remarkable pace in the years ahead, driven by ever-changing consumer demands. E-commerce and globalization have added an extra edge to the fragrance ingredients market as countries with emerging economies have consumers reaching out to buy famed North American and European products helping to expand their demand and reach. Increasing disposable incomes among such consumers have encouraged them to use more personal care products as well as cosmetics which has again indirectly added momentum to fragrance ingredients industry. In the developed nations while the recovering economy is indicating a positive trajectory for perfume and consequentially fragrances ingredients industry, fragrance companies are trying to offset higher costs by introducing eco-friendly products and well-priced gift sets. Innovations are also changing the face of the perfume industry. For instance, the application of perfumes is not being limited to the neck and wrists. Instead perfumes are being created that can be applied to the hair as long hair is very good at retaining fragrances. More mists, oils and shampoos are being produced that can help hair strands to retain a favorable fragrance. New methods of marketing are also expanding scope for the perfume industry. For example, several new services are being offered that lets the customers try on different perfumes for a month and then decide their favorite or use personality quizzes to match a perfume to the user. 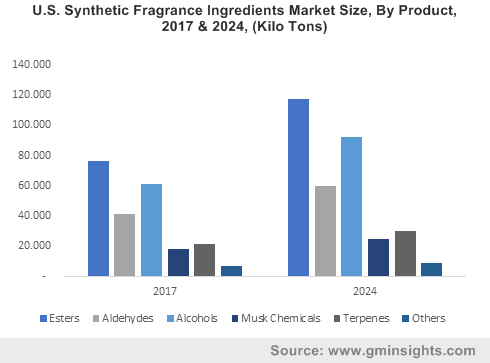 As the consumer base for perfumes and fragrant products continue to expand, it is apparent that the fragrance ingredients market will continue to grow substantially. Innovation in the perfume industry has been extended to merchandising solutions such as Paperscent, a device that dispenses perfume samples on paper in department stores thus making the test bottle redundant. With consumers demanding more varied scents to be made available and to be used in products, the fragrance ingredients industry is expected to traverse alongside a profitable growth trajectory over 2018-2024. This entry was posted in Bulk & Specialty Chemicals and tagged Alcohols, Aldehydes, Cosmetics, Esters, Fine Fragrances & Perfume, Flower Based, Fragrance Ingredients Market, Fragrance Ingredients Market Share, Fragrance Ingredients Market Size, Fruit Based, Musk Chemicals, Natural Ingredients, Soaps & Detergents, Spice Based, Synthetic Ingredients, Terpenes, Toiletries, Wood Based. 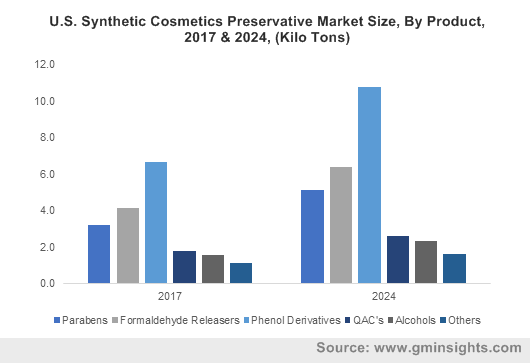 The rising demand for cosmetics pertaining to the ongoing trend of image consciousness has brought a major change in cosmetics preservative market dynamics. Being a mixture of various peptides, oils, carbohydrates and water, cosmetics can prove to be a convenient breeding ground for bacteria and fungi which if left unabetted can necessarily alter the formulation of the product, generating the need for preservatives. Skincare, hair care, make-up, perfumes, toiletries, deodorants, and oral cosmetics are infused with preservatives to not only maintain the original quality but also to extend their shelf lives, thereby propelling cosmetics preservative industry. The United States is estimated to have the world’s largest cosmetics industry, though numerous other geographies, especially the economies in developed countries are now catching up with the likes of the U.S. One of the principal reasons for emerging economies to attain a substantial share of cosmetics preservative market is the rising disposable incomes of consumers across these regions. This entry was posted in Bulk & Specialty Chemicals and tagged Alcohols, Baby Products, Chemical Preservatives, Cosmetic Preservative Market, Cosmetics Preservative Market, Cosmetics Preservative Market Size, Essential oil, Formaldehyde Releasers, Fragrances and Perfumes, Hair Care, Herbal Extracts, Natural antioxidants, Natural Preservative, Organic acid, Organic Preservatives, Parabens, Phenol Derivatives, Plants Extracts, Quaternary Ammonium Compounds, Skin Care, Synthetic Preservative, Toiletries.